Groups in years 7-11 are taught in six lessons per fortnight. 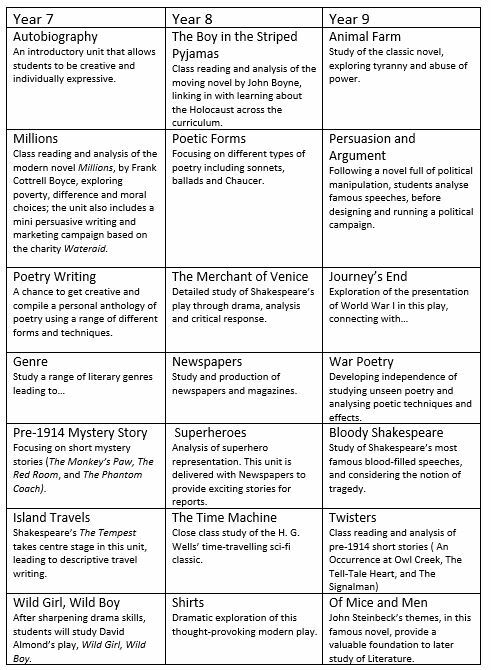 Students in years 7-9 follow a common ‘core’ syllabus which is challenging and imaginative to suit the capabilities and interests of our students. At Key Stage 4, where all students currently follow the Edexcel specification in both English Language and English Literature, boys are encouraged to realise their potential. After integrated Drama and Media Studies teaching in the lower school, students may also choose to pursue a separate GCSE in Media Studies. In the sixth form, students may take A-Level English Literature, following the Edexcel specification. Alternatively, students will follow the International Baccalaureate route, in which, English Literature is a core subject. Across years 7 to 9, students develop and broaden their skills in responding to and producing texts in a range of contexts. Our aim is to familiarise pupils with poetry, prose and drama from Chaucer to the present day, and with creating written and spoken texts for different audiences and purposes, with a high degree of accuracy in terms of grammar, spelling and punctuation. Above all, students are enthused with a passion for English and culture, and develop an appreciation for the importance of the subject in enhancing skills needed to succeed across the curriculum and in later life. Students receive 6 hours of English each fortnight, and lessons feature a range of teaching and learning methods from group work to individual tasks; class discussion and debate to video making and delivering presentations; and independent research to problem solving. In addition to lessons in traditional classrooms, we also make use of the library to encourage a love of independent reading: students follow a reading reward scheme through each of the first three years, supported by the library staff. Library lessons also feature regular exposure to 19th-century texts, and comprehension skills. Additionally, students have regular opportunities to learn through computer and drama-based lessons in the respective studios. In the design of the sequence of work, emphasis is on full works of literature, in line with the national curriculum, augmented by a range of non‐fiction and media texts. These skills are the underpinning of GCSE English Language and English Literature. Through follow‐up group, individual and speaking tasks, students will be able to target specific weaknesses and improve their attainment in these areas. Extra support is given as necessary. Day‐to‐day work will be assessed to encourage students’ progress, and is judged holistically on a scale (outstanding, excellent, good, satisfactory, and inadequate). Commendations are awarded for continued high‐quality work, significant improvement, or particularly outstanding pieces. The department offers a wide range of clubs including Extension, Drama, Debating, Film Club, TQM Magazine, and Creative Writing. When available, trips are arranged to relevant theatre productions. Success at national competitions is longstanding including The Spelling Bee, Lit Quiz, Direct Marketing and Young Sports Reporter. All students in Years 10 and 11 follow a combined course in both English Language and English Literature which leads to TWO separate certificates at GCSE. Both are traditional academic subjects of high status, valued by employers and universities. We use a variety of resources including plays, novels, poetry and non-fiction texts to give students experience in speaking, reading and writing about a wide range of materials. In lessons, we encourage a variety of viewpoints to be shared in discussions, and use oral presentations, improvisation, scripted drama, audio, lectures, video recording and research sessions to extend understanding and develop key skills. Varied homework tasks include reading, research, learning spellings, grammar exercises, preparing oral work, and drafting essays. You may also have the chance to see performances and attend workshops. All year 9 students are expected to read the first text, Lord of the Flies, over the summer holiday before beginning year 10. Reading: following arguments and collating material from various sources; understanding how writers and speakers achieve their effects. Writing: communicating fluently for different purposes and audiences; improving grammatical accuracy and extending vocabulary. Speaking and listening: the ability to communicate clearly and with confidence in different situations; listening and responding; discussion. HOW ARE ENGLISH LANGUAGE AND ENGLISH LITERATURE ASSESSED? There are two English Language examination papers; each one is based on an unseen passage, and will assess reading and writing skills. There are two English Literature examination papers; they require understanding of novels, a play and an anthology of poetry, and will assess responses to the set studied texts: Lord of the Flies, Macbeth, Frankenstein and Conflict poetry. The GCSE course is excellent preparation for A-Level English Literature and for the IB route; it also relates to topics in A-level Media Studies and, with its emphasis on developing reading, writing and research skills, combines easily with any other subject. English is valued as a minimum requirement for entry to most professions and a facilitating subject for all University departments. Skills developed are important for a wide range of professions including Journalism, Law, Medicine, Advertising, Business and Psychology. You will need at least one grade 7 and one grade 6 in GCSE English Language and English Literature. You should enjoy English, be prepared to read a variety of texts and be able to write essays. There is a wealth of heritage, ideas and inspiration to be found in texts. The study of literature opens your mind to new worlds, concepts and opportunities. Language, too, reveals a lot about the human mind; words can be combined in thousands of ways, and have even more interpretations. The IB course encourages you to develop many skills valued by both employers and Higher Education. You will develop skills of inquiry through becoming equipped with a variety of critical approaches to aid your reading, whilst developing a broad knowledge base of literature. A range of literary works of different periods, genres, styles and contexts will be read to expand your perspectives of not only English heritage but also of texts from other cultures and languages; you will need to be open-minded to new ideas, which emerge both from the works studied and from other people. You too will be taking risks, as we will encourage you to be confident in sharing your own and original responses. Modern Novels is an exciting opening to the course, where students study three novels, all dealing with the theme of masculine identity. A Clockwork Orange, Fight Club, and The Sailor Who Fell from Grace with the Sea, inspire lively debate throughout the first term. Students deliver a short presentation in this unit. Works in Translation provides balance to the first unit, as students study plays (three at higher, two at standard), originally written in other languages, dealing with the theme of feminism: A Doll’s House, Miss Julie and Antigone. This unit is assessed with an essay and a written reflection on a group discussion. Detailed Study involves close examination of a theme across a range of genres. Students will be looking at innocence and experience in Blake’s poetry, I Know Why the Caged Bird Sings and The Great Gatsby. Assessment is through a short oral commentary on an extract, followed by discussion. Groups of Texts is the final unit, in which students study plays. The Tempest, Translations, and Our Country’s Good are an exciting collection linked by the theme of colonialism. Additionally, higher level students will study The Royal Hunt of the Sun. The course ends with two examinations. One involves analysis of an unseen text; the second asks for an essay response to the plays studied in part four of the course. As assessment involves two oral and one written piece of coursework, as well as two examinations, students’ powers of communication will be extended and developed: essay writing, creative work, drama, and a range of oral tasks feature. Teacher-directed discussion, student-led seminars, lectures, web-blogging, DVDs, theatre trips and one-to-one consultations, ensure a range in the delivery of the course. The emphasis is on encouraging students to enjoy reading and discussing texts, whilst developing skills in criticism, analysis and synthesis. You will need at least one grade 7 and a grade 6 in GCSE English Language and English Literature. Success in English is proven, with many students achieving outstanding results. Last year, 90% of students achieved a top grade. The new A-Level specification has only a few texts to read, with a focus on the depth of knowledge of these chosen texts. + 1 coursework essay on two texts of your choice. You will research the background of writers, allowing you to set texts in their historical context, as well as appreciate their modern-day appeal. There may be opportunities to see performances at Stratford and local theatres, as well as take part in workshops. We also offer additional ‘extension’ lessons which allow students to explore aspects of English beyond the A-level syllabus. Lessons are currently in groups of 10-20 allowing for an interactive and lively approach to the appreciation of literature. This friendly environment allows for a variety of viewpoints to be shared and valued in discussions. Improvisation and dramatised readings, DVDs, and analysis of various texts and extracts also feature in the course. Classes are taught jointly by two teachers. Examination are held in May/June at the end of year 13.